As in other areas of the country, the demand for trained security officers is on the rise. 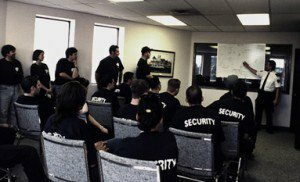 To help you navigate thru the requirements for this highly sought after occupation we’ve created this comprehensive guide on Alberta security guard training. The Security Programs department is part of the Law Enforcement and Oversight Branch of the Ministry of Justice and Solicitor General. The Branch administers the Security Services and Investigators Act, Peace Officer Act, Body Armour Control Act, First Nations Policing and Law Enforcement Professional Standards for the Province of Alberta. Under the Security Services and Investigators Act the Security Programs department is responsible for oversight, licensing and compliance for the security, investigator and locksmith services industries in Alberta. Under the Security Services and Investigators Act, individuals working in the security, investigation and locksmith services industry must be licensed. Working without a licence is an offense under the Act and may result in fines or court appearances. Applicants for individual licences must meet basic licensing requirements and training qualifications before applying to receive a licence. Individual licences are issued for 2 year terms and are subject to the terms and conditions of the Act, Regulations and Policy. Applicants should familiarize themselves with these documents and their rights and responsibilities under the legislation. Every applicant must undergo a police information and criminal record check at the time of application and every 2 years at the time of licence renewal. Checks are performed by the police services in the community where an applicant resides. Contact the police service for hours of operation and fees. Individual licences are issued for a 2 year term. The cost is $100 per term. Effective June 1, 2011, all applicants for a security workers licence in Alberta must successfully complete a mandatory training course or provide proof of equivalent training in order to qualify for a licence. Existing licensees and individuals renewing a licence are not required to complete mandatory training at this time. See the SSIA Approved Training Course Provider List below to find a course that is convenient for you.